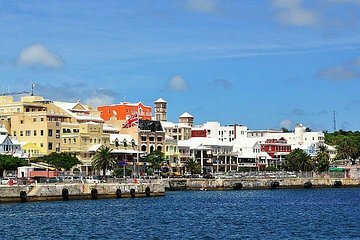 Kom oog in oog te staan ​​met zeedieren, roze flamingo's en meer in het Bermuda Aquarium, Museum en Zoo tijdens deze tour van een halve dag vanuit Hamilton. Begin met een begeleide wandeling door de natuurlijke wonderen van de Crystal Caves (entreegelden niet inbegrepen), sluit af met een glimp van de stad en geniet van winkelen op uw gemak. Ontvang retourtransport vanaf King's Wharf of neem de veerboot terug wanneer u klaar bent (ticket inbegrepen). We made the best of it and really enjoyed the sights. Unfortunately, the way this tour was managed was very disappointing. We met the liaison on the pier and she stated that because only 4 people booked we would need to wait for a smaller vehicle. When the smaller vehicle arrived, it was NOT a tour van. It was a taxi. Instead of having a knowledgeable tour guide as advertised on the listing take us around and tell us about the things we passed on the way to our stops, we had a taxi driver simply drive us to all the locations although she did show us her house. There were three adults smashed into the middle row seat of a small SUV. One of the best tour guides we ever had was at Crystal Caves. He was a wonderful story teller and really helped us appreciate the caves and the history that goes with them. The aquarium was a bit disappointing as it is small and we have a truly amazing aquarium at home. It was a nice stop though. The ferry was easy to use and it was nice to have the flexible time to explore Hamilton and just take the ferry back when we wanted. We stayed at the Grotto Beach Resort, so the Crystal Caves are just a short walk from our hotel, so we'd already done this part of the tour. Well worth it, however, to see the caves. This is a nice tour of much of the island of Bermuda. The Ferry ride was also part of our full meal plan at the Grotto. but the City tour was also worth it. You get a locals eye view of the town of Hamilton. This was a great tour. Granted, you can do all of this on your own (prob cheaper) as the tour doesn’t include admission to anything you do. However, peace of mind and simplicity is always welcomed on vacation. You wake up, meet the driver and enjoy a really nice day around Bermuda! Unfortunately the tide was high and we could only see part of the crystal caves the Fantasy Cave was closed due to electrical issues and height tide they did reduce the entrance fee to 11 vs 22.....still high for what we saw. The best value was the Aquarium/Zoo. The tour of Hamilton was good and very informative, but it would be nice if driver/guide had a mic....difficult to hear narration in van party of 6. Well the Crystal Caves were closed. We drove 90 minutes to see them. I understand why they were closed due to higher then normal tides but the tour company should have known this. I would expect more from tour company. Cave people said they knew the day before that it would be closed. Howard was a great tour guide. He really showed us the island and was a wealth of information. The caves were amazing. Only thing to note is admission to the Crystal Caves and Aquarium is NOT included in the cost of this tour, you have to pay for those in addition. That was a bit of a surprise to me could have been in the fine print and I missed it. However when I did some quick mental math, even with those extra costs this tour is still excellent value compared to other options. AND, the return ferry to the dockyard or whichever ferry stop you wish IS included which was not in some of the other tours. All is all, highly recommended!